The reproductive health burden on women in Tanzania is high. Recent surveys suggest that the average Tanzanian woman has 5.7 children during her lifetime, and that over half of all women deliver at home, without any access to skilled birth care. Around 10,000 maternal deaths are recorded each year – more than one per hour. For every woman who dies in child birth, another five live with chronic illness or permanent disability. Many women in Tanzania today would like to space or limit the number of children they have. Only one in five women currently use a modern contraceptive method, even though over half of married women report that they would like to begin using one. Promoting long term methods IUDs are a highly effective, safe and reversible long acting family planning method that provide protection against pregnancy for between 5 and 10 years. Widely used in other countries, where women are typically very satisfied with their results, IUDs have not been heavily promoted before in Tanzania. They offer an excellent choice for both limiting and spacing births. In 2009, more than 14,000 women in Tanzania received IUDs through PSI. PSI/Tanzania supports the Ministry of Health and Social Welfare’s objective to raise contraceptive prevalence in Tanzania to 60%, and to reduce maternal mortality by two thirds, by 2015. It is working to increase access to the Familia range of high quality and affordable family planning products and services. To help men and women access the right method for their present needs, PSI/Tanzania offers a comprehensive range of modern, affordable methods under the Familia brand. Condoms are useful for relationships that are perhaps not yet steady or committed, and before each party has had an HIV test to confirm their status. Contraceptive pills and injectables are useful for newer couples planning the right moment to have their first children. More established couples require simple ways to space or limit their family size, and prefer long lasting methods such as IUDs and implants. 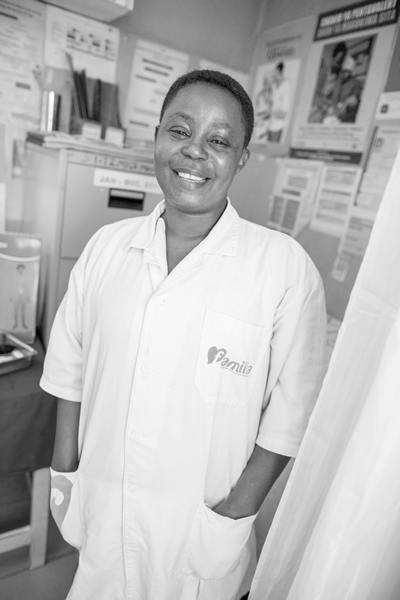 Profile: Mama Lulu – the dedicated private midwife who lacks support In her mid to late 30s, Mama Lulu is a nurse midwife in peri-urban Kibamba. She lives near to her work and is married with children. She herself uses the IUD for family planning and works in a private clinic providing family planning and maternal and child health services. She currently provides short-term methods only as she has not been trained on long-term methods. Client satisfaction is very important to her as it increases her reputation and client numbers. Her biggest concerns are losing her job, and catching an infectious disease from her work. Other than work she goes to the market and prepares meals for her family, even though she has house-help. She likes to treat herself with clothes, and new hairstyles. Her aspirations are to move up the ladder at work with further education for herself and her children. In 2009, PSI/Tanzania developed the capacity of over 150 private and public sector providers to offer high quality family planning services, and will double this in 2010. Mass media, training of providers, equiping of facilities, and creating demand for services around their facilities, ensures that women can access all methods with proper counselling around advantages and disadvantages. PSI/Tanzania aims to reduce the relatively high number of women who start but discontinue their methods by helping women to better understand and manage temporary side-effects. PSI/Tanzania supports national efforts to improve perceptions and change behaviours towards contraceptive methods by working with members of parliament, professional associations, teaching institutions, media forums, and by training pharmacies and accredited drug distribution outlets on all family planning methods. . In 2009, PSI/Tanzania began a new intervention for the prevention of post-partum hemorrhage. Excessive bleeding or hemorrhaging immediately after delivering a baby is believed to occur in around 15% of births, and to be responsible for around a fifth of all maternal deaths in Tanzania. Most incidents of bleeding can be prevented by the use of simple and affordable drugs known as uterotonics, though these are available today for only around one birth in every ten in Tanzania, mainly those in well equiped, urban facilities. Misoprostol is a highly effective uterotonic that has recently been approved for use in Tanzania by the Tanzania Food and Drug Authority. It has the unique advantages of coming in pill form, not requiring refridgeration, and having a long shelf life, making it ideal for reaching out to rural areas where most births, and maternal deaths, take place. PSI/Tanzania is working with the Ministry of Health and Social Welfare and other partners to distribute guidelines to public and private health providers involved in deliveries, organize training of providers, help facilities order supplies, and make sure pregnant women are informed about the importance of delivering with the help of skilled providers who have access to uterotonics such as misoprostol.